Man Down! (349/365) – Annoyingly Boring? 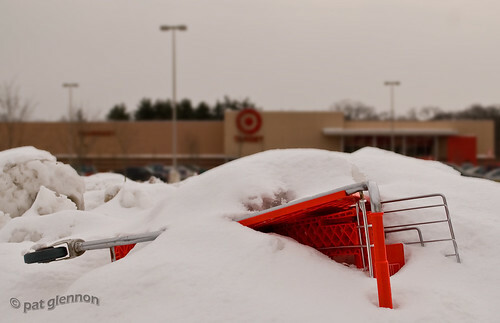 Drove past Target today and noticed this brave warrior buried in a 6 foot snowbank. Fingers crossed that he’ll live to shop another day after some thawing. That thing is too warm and dry to be used at my Target. Love this! What a fun shot. I’m sure you couldn’t resist when you saw it. I wouldn’t be able to. Missed the “Target” by that much. well that is just crazy, pg. in fact, to make it even crazier, i was just thinking yesterday about unintentional matching posts. i run all my photos as a screen saver on the tv in the living room via apple tv. the papa john’s photo that i posted the day you posted a pizza pic came up. i wondered how long it would be until we matched photos again. not so long, apparently. mine looks a bit warmer though. oohhh!!! the poor cart!!! lol!